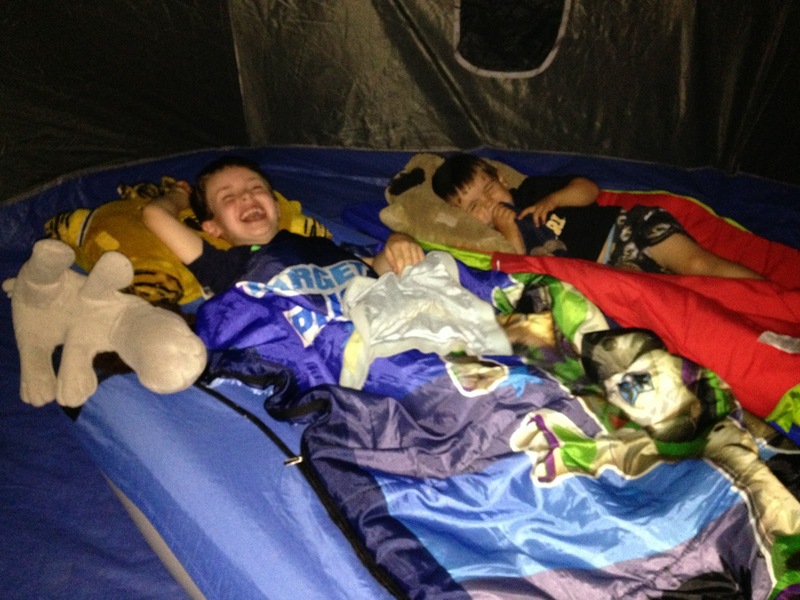 The weekend after Memorial Day, we took the boys on their first camping trip with our neighbor friends. Our friends Darrin and Chrissy did all the planning and there were six families, each of us with two kids. 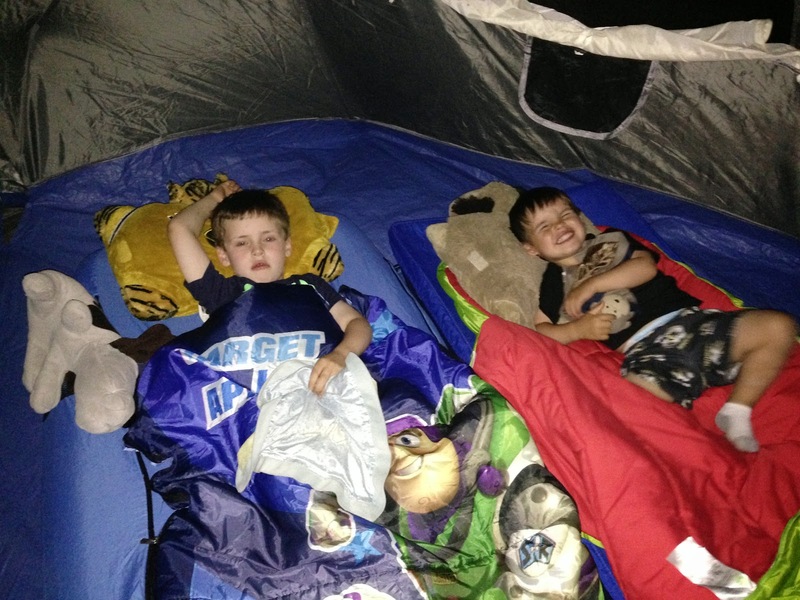 There's a place not more than 10 minutes from our house with a big lake and campgrounds - a perfect starting point for camping with little ones. 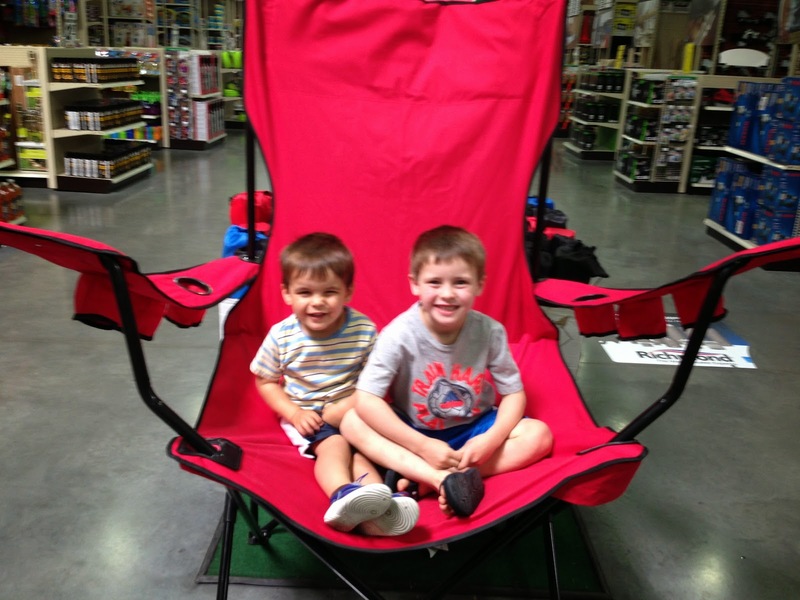 First the boys and I took a quick trip to Menards Saturday morning and couldn't resist trying out this giant chair. We didn't buy it since it was $100 - phew! We headed to the campsite after naps on Saturday afternoon and camped for one night. 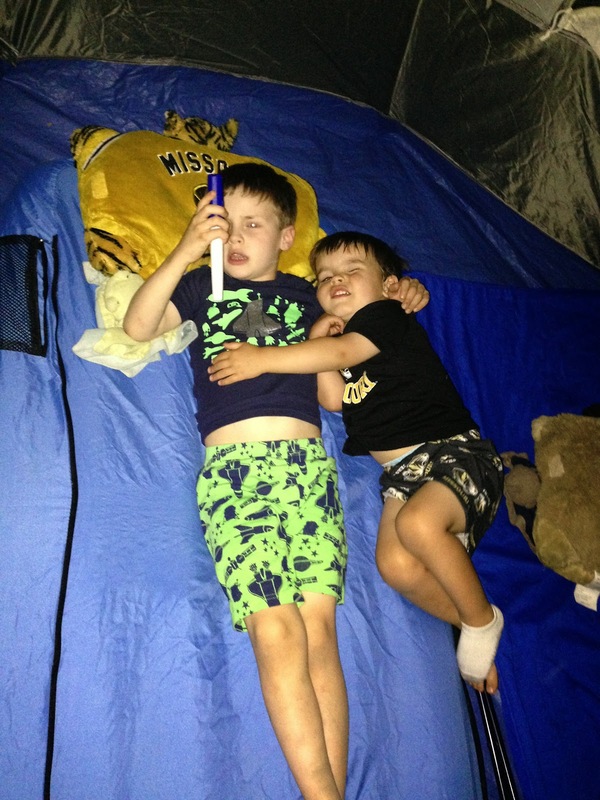 The boys had a blast!! The little guys: Ethan, Charlie and Tyson. Seriously, how cute is this?? The kids spent the evening riding their bikes, playing washers, and just plain running around. It was a lot of fun. When it got dark, we had oodles of glow sticks and made s'mores. The boys did pretty well at bedtime. There was a lot of talking and sitting up but after awhile they gave in and fell asleep. The next morning everyone pretty much just woke up and packed up the campsites. 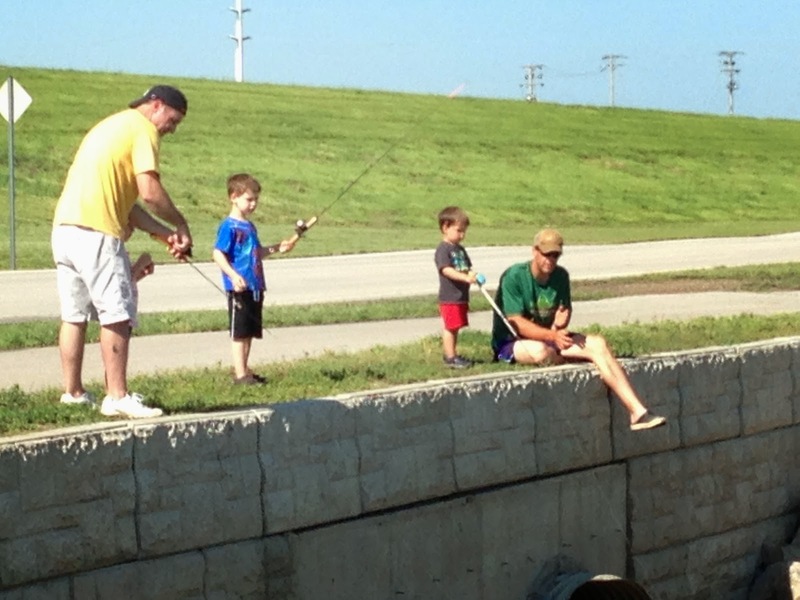 We stayed with Mark and Hayden to do a little more fishing before we headed home. All in all the camping trip was a big success. Despite the rain (and therefore mud!!) we had a fun time. I'd definitely recommend the 'close to home' spot for a first trip with the littles. 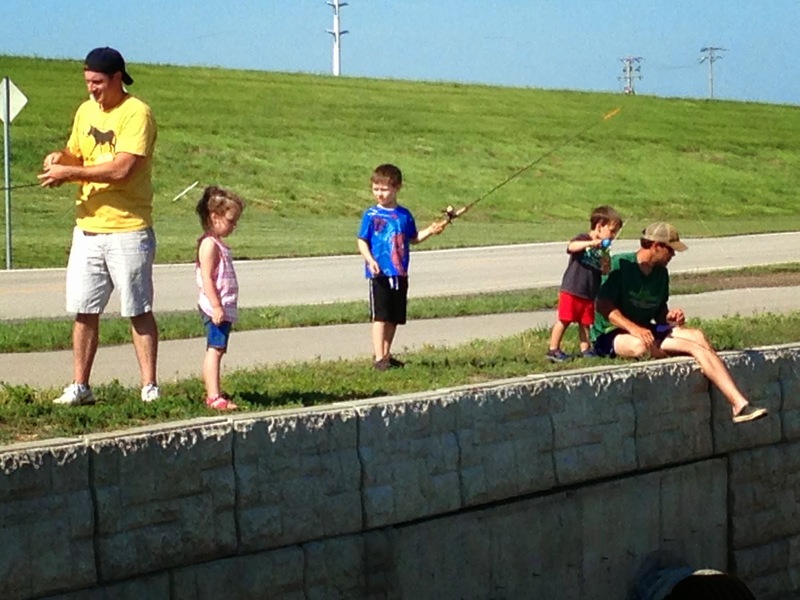 AND in addition to playing in the rain, we checked off #1 (go camping) and #27 (go fishing) from our list.